I think it goes without saying, but I love words! Perhaps it's the writer in me, but I seriously just cannot get enough! Words have such a way of encouraging and inspiring. This is why when you walk into my home you'll see these words of inspiration everywhere. These words we see every day help to remind us that we are home, that we have hope and grace, that we are loved...they remind us who we are. Which is why today I am thrilled to share with you an amazing can't beat deal from Dayspring! Their Letterpress Blocks Everyday Words and Inspirational Words Sets are on sale for just $50!! That's 60% off!!! These fun blocks are the greatest. First and foremost, I absolutely love the style... they're gorgeous. But the best part is they are versatile! Each box contains letters to make a variety of words, and if you have both, you can create even MORE great words that will help make your house a home! (And of course, you can always create your own words too!) They include metal clips that allow you to think outside the boring straight across layout to make a look that's truly your own (although, boring is fine too and still looks great!) 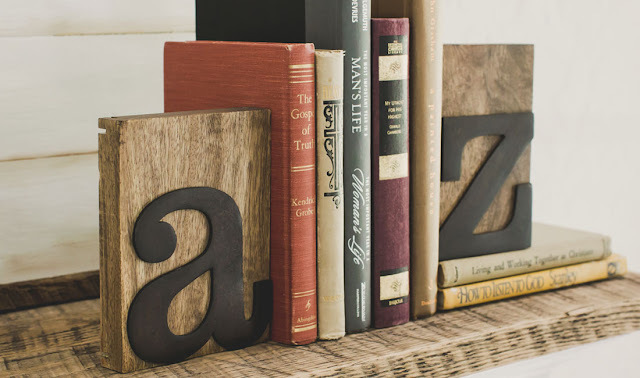 From creating cute bookends to spelling out your family name--- these blocks are so fun to incorporate into your home decor! Check out this link to see some fun ways to use them! Sounds fantastic, right? If you want to start sharing the words that matter to your family, head on over to Dayspring to take advantage of this amazing offer! Hurry- the sale ends on August 18! Oooh I love these!! So super cute!! And you could do so so much with them!! Thanks for sharing!! I got a set of these blocks a couple years ago. I have them to spell out the word "Forgiven". Love them, and they look so nice. I am going to be making some of these for my mantle for the holiday coming up, looking forward to this project.